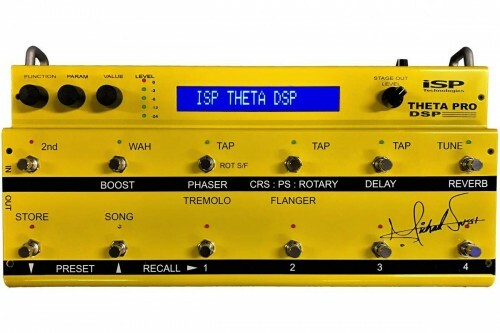 The THETA PRO DSP includes ISP Technologies THETA preamplifier, vintage preamplifier both with extensive pre-and post equalization, Intelligent Speaker Simulation plus a library of studio quality 32 bit floating point digital effects including wha wha, compressor, multistage stereo phaser, stereo flanger, tremolo, four voice chorus, pitch shifter, stereo rotary speaker (leslie) 1300 millisecond delay, ping-pong delay and a stunning studio reverb all with a full featured tuner with 1/2 cent accuracy. The Michael Sweet THETA PRO DSP™ is a Floor controlled guitar system with a fully programmable digital Theta preamp, Vintage preamp plus Studio quality effects processing. 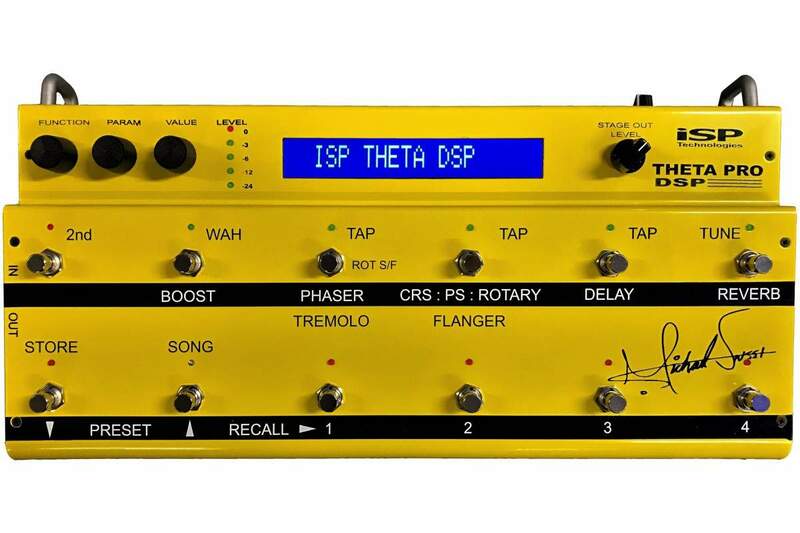 The SWEET THETA PRO DSP has been personalized by Michael Sweet which includes his signature on the top of the pedal plus Michael’s tone sculpting. Following Michael’s input the MS THETA PRO DSP now includes a 3 band full parametric equalization, bass and treble post distortion and ships with the 11 personal presets designed by Michael and used in both his recordings and live applications. The MS THETA PRO DSP now also includes a tuner function and the most realistic true stereo Rotary Speaker (Leslie) algorithm. Michael has been using the THETA PRO DSP for over a year to achieve his own sound and now you can own a piece of Rock History with the limited run signature Michael Sweet THETA PRO DSP. The preamp section delivers more tone shaping and gain flexibility than any other processor available. The MS THETA PRO DSP is based on ISP Technologies’ DSP platform using a 32 bit floating point processor and the latest generation of high quality audio converters. Using novel stacked converters the input noise floor feeding the digital domain exceeds over 124db. This amazing input dynamic range combined with over 1500db interanl DSP dynamic range, due to the floating point architecture, and ISP’s proprietary oversampled clipping algorithm, make the ThetaPro the only digital domain preamp that can offer massive amounts of usable gain (more than any DSP processor available) without any aliasing or noise. The MS THETA PRO allows preamp adjustment of tone, gain, saturation and dynamic modulation in the form of “SAG” allows you to emulate the dynamic aspects of vintage tube amplifiers, which provides the actual feel of vintage guitar amps with tube rectifiers. Fully programmable with a DSP software implementation of the ISP Technologies Theta Preamp, the MS THETA PRO DSP provides super high gain and zero aliasing, which is typical in other digital preamps. The MS THETA PRO DSP has stereo outputs for your stage rig, letting you drive a power amp and typical guitar cabinets, plus balanced XLR outputs with selectable TRUE SPEAKER™ digital guitar speaker cabinet and a headphone output also with TRUE SPEAKER. ISP’s ground breaking TRUE SPEAKER is a departure from typical speaker simulated outputs, which provide a simple filter response. ISP’s TRUE SPEAKER provides convolved speaker outputs providing the actual time domain and frequency response aspects of vintage speakers including adjustable microphone placement. With TRUE SPEAKER, the THETA PRO DSP is the ultimate direct recording guitar system with the total realism of several different styles of guitar speaker cabinets and a microphone. TRUE SPEAKER captures the sonic magic of a classic guitar cabinet transduced in air with a microphone in from of the cabinet. Previous attempts to provide a speaker simulated output simply did not duplicate an actual guitar cabinet recorded with a microphone. Also included is a library of studio quality 32 bit floating point digital effects including wha wha, compressor, multistage stereo phaser, stereo flanger, four voice chorus, 1280 millisecond delay, ping pong stereo delay, stereo rotary speaker (Leslie) and a stunning studio reverb with multiple selectable parameters, plus built in full function tuner. Instant access to your effects allows you to switch your individual effects on or off within any of your programmed and stored presets plus a MIDI dump / load for archiving your data. Rear panel inputs for an external expression pedal map able to countless parameters for on the fly control is also included plus a dedicated input for volume pedal. The ThetaPro DSP is designed and manufactured in the USA and is covered under US Patents 6,944,305 and 7,532,730.